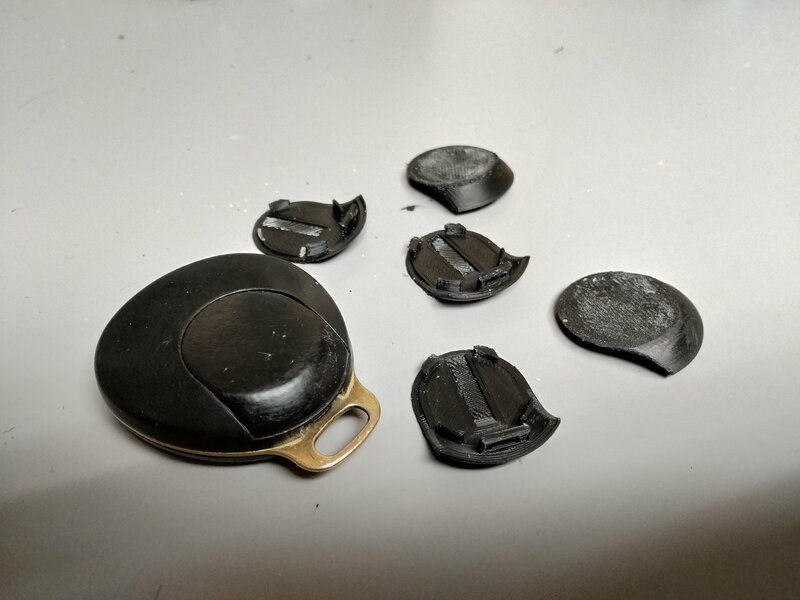 Remote Key Fob battery cover 3D scan needed! 3D printing this in black would then be very simple and cheap. Can't agree with you more. It is a pity that no replacement covers are available. Many good working key fobs are being sold but with no buyers as the back cover is an essential omission. Wonder mouldable plastic can be a convenient substitute. Hope some have done so and can share with us how to make it nice and easy. 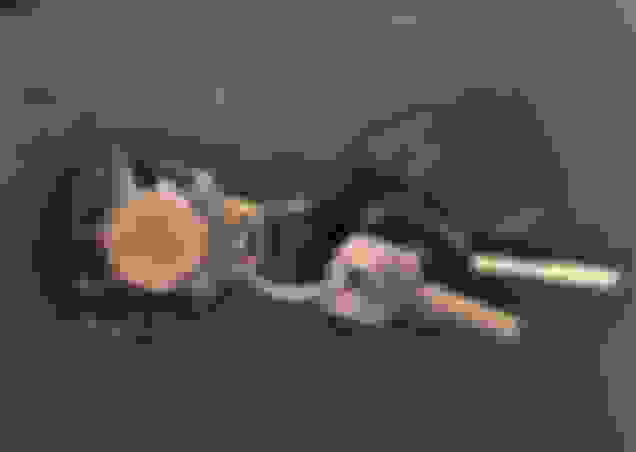 I've finally received a reply from one of the companies that would be willing to 3D scan this(I've emailed 5+) and they want ~£60($85) for it so a bit too much for me, for what it is. I have one spare remote without battery cover. I probably owned ~20 of these remotes in the last 10 years and I don't think even 5 had the covers so hopefully someone here with an access to a scanner might have more luck than me! I feel lucky that my fobs have their covers, I had no idea this was a problem with these. dagny747: Yeh, duct tape works, but not pretty. See mine below. 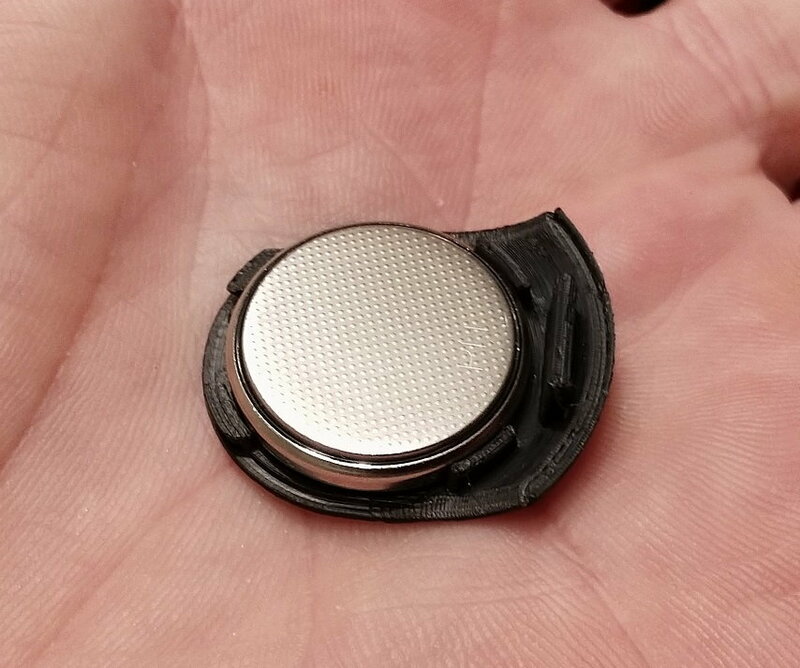 I happened to find a dime that fits and holds the back of the button batteries; I added a layer of insulation before taping it in place. I suppose I can find a duct tape in black, but down under I know it is still not perfect. I bought a bag of mouldable plastic in black but never get round to trying it, maybe because I still have a back up key fob that is complete with the back cover. Scotlad: This is indeed a common problem. You will not be surprised finding many listings on eBay selling good, used key fobs without the back covers for cheap (compared with those complete). 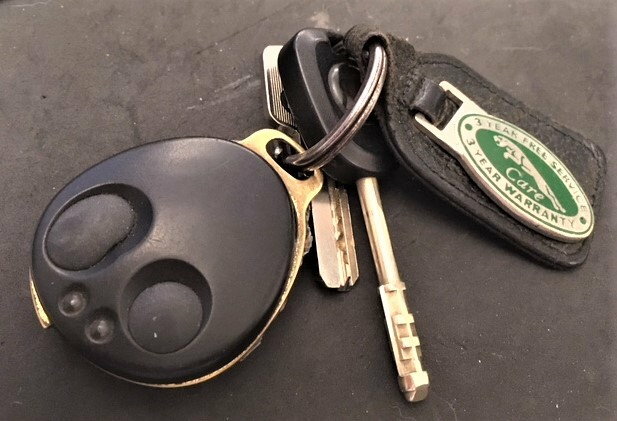 New key fobs are no longer available so there is still a demand for used ones. The back cover is too small and tricky to remove so you can lose or break it during battery replacement. I lost mine that way. I am hoping that soon we will have a "sticky" or separate section with 3D printer files for our small plastic parts. Creating the scan and file seems to be the biggest hurdle, right? ........Creating the scan and file seems to be the biggest hurdle, right? Hmm, 3D printing is not popular where I live, so just have to learn how and where to do it. I have the back cover in another key fob. If you could come to London, then I could make a 3D scans of key fob easily. In our laboratory, we are dealing with Artek Eva Light, and this will not be a problem at all. Unfortunately, it scans only in black and white, but I think it will be ok you. Also we don't have the 3D printer, so you'll have to find a company that can make several prints for you for a small reward, I've seen some ads recently. PM me if you want. Qvhk made me aware of this topic. I do have a small 3D printer and some access to a basic 3D scanner. If there is a member in my neighborhood (NW Illinois) willing to lend his spare keyfob with a battery cover, I could try to experiment and see if I can successfully scan the cover, make 3D model and print on my 3D printer. This is pretty cool. I will take a few. Heck, you could start a business by selling these. I learned to go down to my local Pick and Pull and ask them for the remotes just o grab the backs. Looks good, what's the surface finish like on the other side? Since I'm using ABS material, I smooth it out using acetone, so it looks pretty good. I did this as well a few years ago. I modeled it in SolidWorks and printed it in ABS on a FDM printer. I did make a small modification so the cover it held in place by a 1mm screw instead of a tab. It's easier to open that way. The images shown below look like they are done with a .010" or so filament diameter; my machine can go to .005" resolution so the finish and fill are a little denser. I didn't try acetone but it would certainly smooth the surface. I'm always concerned about changing dimensions on interior features. I'll did up images of the part I made just to further the discussion. 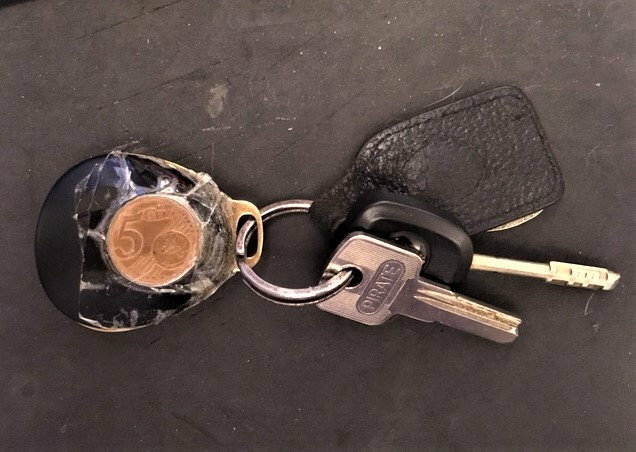 Quick Reply: Remote Key Fob battery cover 3D scan needed!